Wet-dry vacuum cleaners are specialized types of drum or cylinder vacuum cleaners that can be used to clean wet dirt or even liquids. After cleaning wet dirt or liquids, they have to be cleaned thoroughly. Wet-dry vacuum cleaners are specialized types of drum or cylinder vacuum cleaners that can be used to clean wet dirt or even liquids. After cleaning wet dirt or liquids, they have to be cleaned thoroughly to avoid developing any unpleasant odors. They are powered with electric motor or very often by compressed air – compressed air wet-dry vacuum cleaners are common in industrial plants, manufacturing facilities and workshops that already have steady supply of compressed air. Wet and dry vacuum cleaners come in different sizes and for different applications – they can be small handheld car or kitchen rechargeable wet and dry vacuum cleaners or larger wet and dry drum vacuum cleaners for hotels, hospitals etc with all possible varieties in between. Which wet and dry vacuum cleaner to choose? 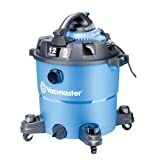 Which is the best wet and dry vacuum cleaner depends on many things, mostly on personal preferences and needs, but be careful regarding regular cleaning of these appliances – if you vacuumed regular dry dirt, ok, but if you did vacuum wet dirt, clean your vacuum cleaner to avoid smell.